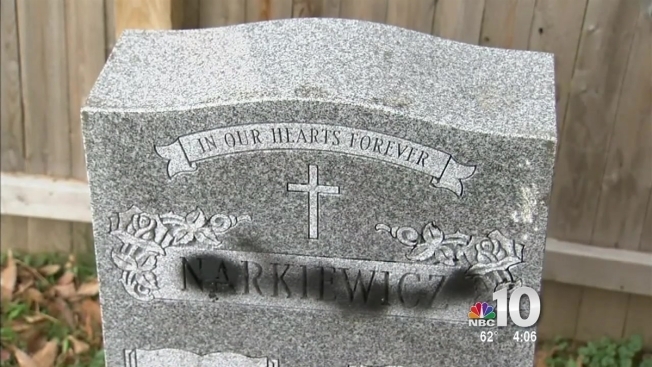 A grudge over $300 that lasted for 56 years led to the repeated vandalism of a gravestone at a Montgomery County cemetery, according to police. Paul Donovan, 68, of Phoenixville, was arrested last week and charged with theft and vandalism. Police say Donovan repeatedly vandalized a man’s gravestone at the St. Matthews Cemetery in Conshohocken, Pennsylvania. The vandalism, which lasted from the Spring of 2014 to Nov. 6 included black and red paint, as well as tar on the same gravestone. Police determined the vandal was targeting one family and set up a surveillance camera in the tree above the gravestone. They then captured surveillance images of the suspect which NBC10 released last week. After that, the tips came in leading to Donovan’s arrest, officials said. Police say Donovan has a relative who is buried at St. Matthews not far from the vandalized gravestone. After his arrest, Donovan allegedly confessed to the crime. What police say was most shocking however was his motive behind it. Donovan allegedly claimed he would pay the victim’s family the money the vandalism cost them, minus the $300 he says he’s still owed from 56 years ago. Donovan is set to appear in court in December.